Butterflies in and around Mexico City--a Princeton Connection? Though I had hoped to visit the mountain range several hours west of Mexico City where our Monarch butterflies overwinter, I had to settle for a few sightings of tiger swallowtails in the city, along with this collection of butterflies suspended above Freda Kahlo's bed. On the flight home, the United Airlines "Hemispheres" magazine featured an article on the Monarch butterflies. The article documents the struggle to save the mountain habitat for the Monarchs, particularly the efforts of the World Wildlife Fund to help locals develop income from tourism so that they don't need to keep cutting down the forest to make a living. That effort has been successful, the mountain habitat is now protected and on the mend, but now the Monarchs' incredible annual journey is threatened by industrial farm practices in the U.S., and the human-caused climate change that is very rapidly altering the timing for the long migration, and increasing the likelihood of extreme weather like droughts. The situation points out how even heroic efforts to restore habitat are vulnerable to being trumped by the rapid changes being wrought globally to our atmosphere and oceans. If hardships during the 2000 mile migration reduce the number of Monarchs that make it back to their overwintering site in the fall, fewer tourists will make the pilgrimage to see them, which will then undermine the sustaining tourist economy in the Bioreserve and prompt the locals to return to cutting trees down for a living. The Monarch's precarious situation also points out the cumulative impact of multiple stressors. An overwintering habitat reduced by logging over the years from 50 acres down to 3; the loss of hedgerows and the introduction of Roundup Ready corn and soybeans in the midwest that allows farmers to kill all the "weeds" that used to provide food and breeding grounds for the migrating butterflies; the increasing extremes of weather. All of these conspire, and for those (probably not readers of these posts!) who don't care much about butterflies, the same cumulative environmental stresses can play out on human economies as well. Other related posts can be found by typing the word Monarch into the search box at the top of this page. An example is "Native plants feed the needy next to Mountain Lakes." in the middle of a garden. that serves as a backdrop for a restaurant a few blocks away from the Zocolo in Mexico City. that look like an extension of this much older approach of putting ceramic pots on a wall. and this traditional motif on a wall along a narrow street that leads to the plaza. A post from 2009 about a similar garden in Madrid can be found at this link. Sometimes a tree fills an architectural space perfectly, as with this Jacaranda tree in a courtyard near an open market in the San Angel neighborhood of Mexico City. In the same family as our catalpa trees (Bignoniaceae), it dotted city vistas with lavender during last week's visit. I first encountered Jacarandas (the "J" sounds like "h", and each "a" sounds like ahhh) in Buenos Aires, where their dark branches twist and turn high above, silhouetted against the highly dissected foliage. There's an aphid that lives on the trees, excreting honeydew that can feel like very light raindrops to pedestrians below. I never noticed this sort of precipitation, but it could make for an interesting effect for any diner in this plaza who strays beyond the cover of the umbrellas. In the Coyoacan area of Mexico City, the Jacaranda flowers greeted us in the courtyard of the bed and breakfast. Our catalpas have a white version of this flower. Native to Central and South America, Jacarandas have been planted elsewhere in the world, including Florida and the southwest. In the Viveros of Coyoacan--a large tree nursery that also serves as a jogging mecca much like New York's Central Park--one of the trails is named after the tree, though I didn't find the glorious corridor of color I had imagined. Sometimes you have to go up on a rooftop, in the more utilitarian company of water heaters, clotheslines and water storage tanks, to see Jacarandas much better. During a recent visit to Coyoacan, a historic neighborhood in southern Mexico City that once served as Cortez's home base, we passed by the long lines at Freda Kahlo's house and walked a few extra blocks to check out the walled-in house and courtyard of another historic figure, Leon Trotsky. The Russian revolutionary spent the last three years of his life in exile in Mexico, where he was granted asylum at the behest of Diego Rivera. Turns out he raised chickens and rabbits, which he spent the first hour or so of every day caring for. The physical work and interaction with the animals "provided rest to his spirit and distracted him", but it also may have helped stimulate his thinking: "Sometimes he interrupted his labour to dictate a thought, an idea that had arrived to his mind while he was doing this work." That connection between hand and mind, manual work and intellect, is one of the rewards of not outsourcing all manual work, and exploring which aspects of lifestyle are worth adopting from past eras when machines were less ubiquitous. Raising chickens and rabbits may also have helped him survive increasing seclusion, given that the danger of attack by an agent of Stalin made any venturing outside the walls of his compound risky. His falling out with Stalin led to his exile, and the assassination of nearly all of his family members, including finally himself when a Stalin agent penetrated Trotsky's inner circle in 1940. Trotsky was also in to cacti, which he had dug up from surrounding hillsides that surely have long since been engulfed by urban growth. Afterwards, we waited out the lines at Freda Kahlo's house, and found therein, tinged with rant, her expression of connection with people who use their hands to make a living. Life is pretty good for the backyard ducks these days. The miniponds are swelled by recent rains, and the ducks' owners have given them some quality frolic time out of the coop they share with the chickens. Much as the chickens' showed us how much a backyard could be loved, with their infinite interest in the ground and the bugs and seeds it might hold, so the ducks have shown us what it means to really love water. Using their heads to toss water on their backs, diving, dipping or suddenly launching into a session of joyous thrashing, they revivify all those old expressions about ducks and water. It's easy to believe that they are fish at heart, who maintain wings and feet as backup options. They don't so much drink water as maintain a current of water through their bodies. This makes them a bit messy in their cohabitation with chickens, which are by comparison much more land-based and clean. Whereas chickens peck with precision, ducks gobble, especially the big, wobbly Pekin duck on the left, which sends food flying with its gourmandering. The runner duck, by contrast, is a more graceful and delicate creature, holding its head high and steady like a ballet dancer as it walks. We had had good success with taking it for a walk in Herrontown Woods two months ago, so decided to try it again. In the interim, however, the duck (Molly) had developed a mind of her own. Rather than following along with us, she immediately set off for the nearest creek. Fortunately, we found an abandoned dog leash on the trail, which helped keep the duck heading our way. Up at the Veblen farmstead, we walked by snowdrops planted either by Elizabeth Veblen or as part of a Garden Club of Princeton project some 40 years ago. Hurricane Sandy has made lots of miniponds in the forest, where wild and somewhat tame life can stop and take a sip. while bigger, bolder birds of a similar feather take up similarly unlikely residence in the broader Princeton landscape. Here's a disturbing headline for you: "Monarch Migration Plunges to Lowest Level in Decades". The New York Times article reports that the overwintering grounds for monarch butterflies in Mexico has dwindled to 2.94 acres. A number of factors are at play here. Increasingly erratic weather due to changing climate, the switch to herbicide-resistant crops in the midwest, which allows eradication of weeds that used to serve as food and habitat, and past logging of the high altitude forests in Mexico. The warm weather last year sped the Monarchs' travel northward, which correlates with my memory of seeing them in Princeton last summer much earlier than usual. Their multi-generational travel northward in spring/summer is timed with the milkweed, so any change in schedule can affect whether the habitat is ready for their arrival. In preparation for an upcoming trip, I was surprised to learn that the biosphere reserve where the Monarchs overwinter is just a couple hours west of Mexico City. There are several locations where one can hike up to see them, though El Rosario is the easiest to access. Given the multiple locations, it's strange to hear that the total acreage occupied by the overwintering butterflies is less than three acres. Though the butterflies cling to the tree branches at night, in February they become active during the day, flying down the mountain slope to a water source, then back up in the evening to roost overnight. Tourists typically stay over night in the small mountain town of Angangueo, then head to the overwintering sites in the morning. Having remained sexually immature during their long fall migration to Mexico, and through much of the winter, the Monarchs finally mate just prior to heading north in late March. As farm country becomes increasingly an ecological desert, due to reduction in fallow areas and increased spraying of weeds, urban areas become all the more important for sustaining species like the Monarch. Looks like starting new plants of the local swamp milkweed will be part of my "managing water in the landscape" course at the Princeton Adult School this spring. 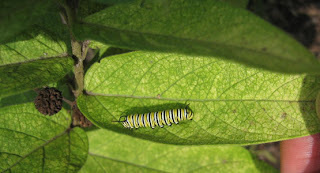 Carolyn Edelmann, who has a far-ranging nature blog, sent me this link to a 6 minute video about the Monarchs' migration and overwintering site. Oswald Veblen is a heroic character from Princeton's past. You can read more about him at my website, VeblenHouse.org. George Dyson, author of Turing's Cathedral: The Origins of the Digital Universe, will give a talk entitled "Princeton's Christopher Robin - Oswald Veblen and the Six-Hundred-Acre Woods". It was the third chapter of Dyson's book on Turing, wherein Veblen's life and contributions to early computer development are described, that showed how deep is the legacy Veblen left behind, and made all the more clear why the house the Veblens left in the public trust should be saved and turned into a nature center, as they had desired. Back in October, Maiden Grass was in its glory. Native to Japan, it was popularized in the U.S. in large part by Washington, D.C.-based landscape architects Wolfgang Oehme and Jim van Sweden. They promoted a new kind of landscaping dominated by ornamental grasses mixed with perennials like Joe-Pye-Weed and Sedum "Autumn Joy". Like cabbage, which was bred to make kohlrabi, broccoli, Brussels sprouts, etc., Maiden Grass is the same species (Miscanthus sinensis) as the less frequently seen zebra grass and porcupine grass. After publishing their book on this new approach to landscaping, Oehme and van Sweden went on a speaking tour. I remember their presentation at the University of Michigan, probably back in the 1980s. During question and answer, one member of the audience, after seeing photos of giant exotic grasses planted next to a native wet meadow, asked if there was any concern about the grasses becoming invasive. The authors claimed not. Since then, I've kept my eye out for instances where these robust, beautiful grasses have turned invasive. In most cases they have not, but I remember a field outside of Providence, Rhode Island filled with them. And though they haven't spread in the NC piedmont, they have become highly invasive on and around Mitchell Mountain, which is a slightly higher altitude and may have different soil type. There aren't any dramatic examples of invasion in the Princeton area that I know of, but on the road from Princeton to Lambertville I noticed a couple of them apparently self-seeded in a field. In this photo, you can see how the Maiden Grass (two specimens in the back) dwarf the native bluestems (same tawny color) closer to the road. If Maiden Grass eventually does become invasive, the same robust qualities that make it attractive in the landscape will cause it to outcompete the native grasses, many of which are necessary food sources for insect species that typically don't consume exotics even if abundant. For this reason, and a desire to focus on natives, I stopped planting Maiden Grass. Some native grasses that have been bred for form and beauty are many varieties of switch grass, and purple muhly (Muhlenbergia capillaris). River oats is another ornamental native, though it can sometimes start seeding in aggressively in the flower bed. You may see the native prairie grasses Indian Grass, Big Bluestem and Little Bluestem growing in fields around Princeton. The first two are tall and attractive in masses, but tend to flop a bit if one tries to use them in an ornamental context. Little Bluestem is shorter, keeps its shape better, and has a delicate beauty to it. Why is this honey locust on Snowden Lane so bristly? The very nasty thorns once protected the tree from giant ground sloths and other megafauna common in America until about 13,000 years ago. Other trees with thorns that may once have served such a purpose are Osage-orange and hawthorn. The extinction of some 40 megafauna species in the late Pleistocene may help explain why tree species like Kentucky coffeetree and Osage-orange are now rare. The animals that once ate and dispersed their fruit no longer exist. An internet search led to a wonderful article on native trees adapted to giant mammals that no longer exist, likely due to overhunting by the first human immigrants to America. My pet theory is that the first American inhabitants, after driving many large prey species to extinction, learned to be better stewards of the land. Arrival of westerners precipitated a similar predatory overstepping and wave of extinctions, such as the passenger pigeon and the Carolina parakeet, followed by at least a partial shift towards better stewardship. The article quotes Dan Janzen, now of U. of Pennsylvania, who gave riveting lectures about the symbiotic relationship between ants and acacia trees in Africa, during my college days at U. of Michigan. Woodcocks are curious looking birds with long beak and stubby body. This time of year, they are doing their mating displays in open fields around Princeton. Here's a report from Winnie Spar, a birder who helps care for the Rogers Refuge--the marsh between the Institute Woods and the Stony Brook (map): March 4: "Despite rather cool temperatures, I went over to the Refuge at dusk this evening and found one peenting and twittering woodcock in the lower marsh across from the main platform. This is the same date on which Fred and I first discovered displaying woodcocks in the marsh last year." Here's a previous post about seeing woodcocks in Princeton, which links to an NPR segment on them. Wood Ducks: At the showing of the Duckumentary, which begins with baby wood ducks jumping out of their nest, 70 feet up in a tree, and landing softly in the leaves, Charles Leck said wood ducks return in late March and the newborns begin jumping out of holes in trees at Rogers Refuge from about May 10-15. That would be something to see. If you're unfamiliar with Rogers Refuge, it's a premier birdwatching site in the floodplain of the StonyBrook, accessible via West Drive, which intersects with Alexander just before you reach the canal. I researched and wrote an ecological assessment and stewardship plan for the refuge some years back. The marsh is kept wet in summer with the help of water pumped from the Stony Brook. The land is owned by the water company, town staff maintain the pump, and the Friends of Rogers Refuge keep an eye on the refuge and have installed viewing towers, a bird blind, and bird houses. A nice cooperative venture. Ducks mate for a year. Geese mate for life, and hang around for a day if their mate dies. He's noticed a ten to fourteen day shift in duck migrations over the years, as the planet warms. Hurricane Sandy devastated coastal lakes like Lake Como in New Jersey. The lakes are important duck habitat. Parting quote: "Never throw a planet away. You just don't know when you're going to need it." A crop of cold cabbage grows, or waits, in a stone-lined front yard garden. Which takes me back to 1977, the Ann Arbor Film Festival, and a 2 minute video that stuck in memory, Cold Cows. It's a silent short, starring a cow, despairing of life in a cold pasture. At the Environmental Humanities in a Changing World conference, yesterday and today at Princeton University, John Grim spoke of The Winter Dance, an American Indian ritual that uses music and dance to lift the malaise of late winter and "carry the people through". That must be what I did a week ago to break a bad case of cabin fever, combining Brazilian music of Airto and Flora Purim with a dance style somewhere between Steve Martin and Steve Carell. Not sure it will become a widespread cultural tradition, but it works. Sadly, cabbages and cows do not have this option for renewing the spirit. The Economist has a short article entitled "Variety is the spice of life: Encouraging wild and diverse insects is the best way to pollinate crops". That's the conclusion of some Argentine researched published in Science. The varied shapes of native pollinators, which includes beetles, flies and butterflies in addition to bees, helps insure the pollen gets well distributed. Update: An additional study with similar result is mentioned in this Rutgers article. The Xerces Society, which "protects wildlife through the conservation of invertebrates and their habitat", has a list of guides for building nests for native pollinators (honeybees were introduced to America from Europe). I tend to think of native bees as perfectly capable of building their own nests, but this free download: "A first of its kind, step-by-step, full color guide for rearing and managing bumblebees, mason bees, leafcutter bees, and other honey bee alternatives. ", may tell a different story. Here's a 2011 post of mine--notes from a talk on native bees, hosted by DR Greenway, including the somewhat revelatory statistic that there are 400 species of native bees in New Jersey. Typing "boneset" into the search box of this blog will yield many posts about the extraordinary diversity of pollinators that visit this native wildflower, which turns into a thriving insect metropolis in July and August. A couple upcoming events in town related to nature, climate change and the humanities. A conference called "The Environmental Humanities in a Changing World" takes place this Friday and Saturday, 9-5, with a mix of speakers and topics, including resident notables Paul Muldoon and Princeton climate scientists Stephen Pacala and Rob Socolow. The conference, free and open to the public, is organized by Ken Hiltner (no relation, as far as we can tell), a visiting professor in the Princeton Environmental Institute. Click here for a schedule. The conference takes place on campus in Guyot 10--a room with challenging acoustics, so sit up close. The Friends of the Princeton Public Library will host "A Conversation on Climate Change" with Stephen Pacala and Michael Lemonick on March 15, in a "supper club/salon" setting at the library. $50 gets you light fare and drinks beginning at 6:30pm, a conversation with two leading spokesmen on climate change, and the feeling of having supported your local library. More info and ticket purchase here. For years, the atrium plants at this office complex up Ewing Street have provided a verdant corridor on the way to my daughters' dental appointments. Tall specimens of fishtail palm and fig tree (Ficus benjamina) remind me of the time I volunteered at a botanical garden to research biological controls to deal with their plant conservatory's pest problem. The large conservatory was a paradise under siege, packed with orchids, towering palms, and other lush tropical plants of every description draped over the fountains and reaching for the sky. A closer look, however, revealed that a war was going on. The greenhouse sheltered not only plants through the Michigan winter, but also legions of spider mites, aphids, scale, white flies and mealybugs that had grown immune to an arsenal of pesticides. Each week, a mild mannered horticulturist would don a moon suit and fog the whole conservatory with a cocktail of chemicals. And each week, the insect pests shrugged it off and went back to sucking the plants' juices. This being in the pre-internet era, it took weeks of phone calls and correspondence to gather information about parasitic wasps and ravenous ladybugs and lacewings that could take the place of toxic sprays. Meanwhile, the conservatory staff were using me as a sounding board for all their complaints about each other, convincing me that humans can be miserable even in a northern winter's version of tropical paradise. With that experience as a baseline, I've been impressed with how the atrium at the office complex has remained consistently verdant over the years, where given the medical setting they probably use little beyond Safers Soap to control pests. This last visit, though, I noticed the characteristic blotching on an umbrella plant. A sticky substance was dripping down from the bougainvillea above, which while looking healthy enough was also playing host to a colony of aphids. Since the plant juice the aphids are sucking is low in proteins, the aphids have to consume a lot of sap to get enough protein, all the while excreting the excess fluid as a sticky substance called honeydew. Here's a fuzzy shot of the aphids on the backside of the leaf, including a winged adult that will fly off and look for a new plant to colonize. I asked the dentist's receptionist about who takes care of the plants. She gave the service a rave review, saying they'd never had a problem with pests. I broke her bubble reluctantly. There's some pleasure in remaining oblivious to these sorts of things, but at the same time it's more interesting to know that something dynamic is going on in what otherwise looks like a static planting. Otherwise, one has to settle for the magazines in the waiting room for diversion. Hopefully, word will get to the plantcare people, some soapy water will be used to kill the aphids by dissolving their waxy coats, and the next chapter of that plant-filled atrium's story, to be read on the next visit, will be "problem caught early, problem solved." Language takes aspects of reality and attaches words to them. One unexpected perk of studying a second language is the discovery that each language divides the world up differently. A word in one language may have no corresponding word in another. Similarly, the sounds used in one language may be missing from another. It's said that we begin as infants able to utter the whole universe of sounds, but gradually narrow ourselves down to only the sounds needed for the language being spoken all around us. My daughter was able to roll her "r"'s early on, but lost the ability because English doesn't require it. My French teacher struggled to say the word "squirrel", while I could listen to her say two vowel sounds that in French are distinct, but to my ear were indistinguishable. Now, if my ear loses the ability to hear sounds that exist in another language but not in mine, might the mind lose the ability to see aspects of reality for which one's language offers no word? And what happens if an activity and occupation vital to a society's longterm capacity to prosper has no corresponding word in the language? That's the dilemma I happen upon repeatedly while tending gardens and managing landscapes. There is no good word to describe what I am aiming to do, which is to make a naturalistic garden more beautiful and diverse each year. Nor is there a good name for this occupation. "Maintenance" suggests something static. "Management" is slightly more dynamic, but can suggest just keeping things from falling apart. "Tending" and "caretaker" at least imply some t.l.c., but don't imply anything beyond keeping things going. "Sustain", "enhance", and "enrich" could be useful if they didn't sound so grand. They tend to crop up in grant applications and mission statements more often than in everyday activity. In any case, they have no accompanying noun for the person performing the action. "Parenting" suggests protecting and nurturing, which is close to the concept, but though a landscaping project may be someone's "baby", it's hard to call someone a parent in that context. This lack of a name for people who not only maintain things but gradually improve upon them is more than a curiosity. It has consequences for what gets done and what sort of world we end up with. In the horticultural world, most of the money, grants, expertise and landscaping awards are directed towards installation. Many times I've seen beautiful gardens installed on public grounds, but no money or expertise dedicated to their upkeep. If the plantings get any attention at all, it's by maintenance staff who don't know which plant to pull and which one to leave. After several years of decline, the planting is mowed down and returns to lawn. Though maintenance determines the fate of gardens, it is devalued because it is viewed as a static activity, rather than a dynamic one that requires a vision for incremental improvement. The more satisfying, lasting and cost-effective approach is to start small and improve the planting each year--to invest less in installation than a steady enhancement. Gardens, as well as nearly all aspects of life--a house, a nation, relationships, a government--could benefit from this process that has no adequate, widely agreed-upon name. To prosper, a garden requires a mix of skill, work, vision and dedication. If there were a word for the person who delivers this highly desirable mix, more people might more fully inhabit that role, and their work would be more fully appreciated. If we look at the world and see a gap where a positive trajectory should be, ask which came first, the gap in the world or the gap in the language. Along with snowdrops and winter aconite in local yards, asian varieties of witch hazel are blooming. This one's on the Shapiro walkway on the university campus. A planting along the Guyot Street bike trail between Jefferson and Moore, with a more southern exposure, is already past. The native witch hazel blooms in October.